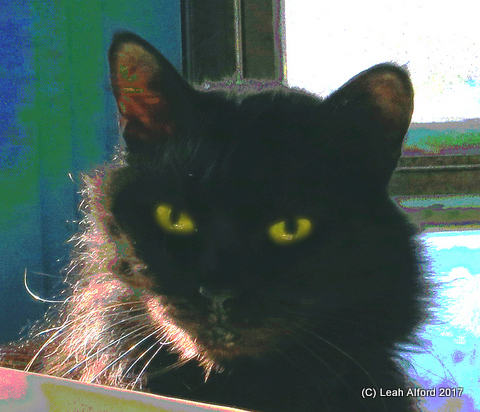 This entry was posted in Book topics, Cat Topics and tagged adopt older cats, black cats, cats. Bookmark the permalink. So very sorry for your loss! It’s never easy with a beloved pet! Thank you Lori, for your kind and comforting words. I am sorry for the loss of your loved cat and am sorry to hear you are having some health issues. Maybe the writing takes the mind off these things for awhile. Be well!! Thank you Judy, I appreciate your kind words. I am so sorry for your loss. Dear sweet kitty, it is so sad and unexpected. She must have had the same illness as my daughter’s kitty who too collapsed last July, but miraculously recovered and was himself another two month until he turned to the worse again and passed away at the age of 14. May they all run free behind the Rainbow bridge. Thank you Inese, for your kind words of sympathy. I’m sorry to hear about the loss of your daughter’s kitty too. It does sounds like they had similar conditions. Our vet thought cardiomyopathy was likely the cause but we don’t know for sure. Thanks also, for the encouraging words about the book! I’m late coming to this, but all the same I’m sorry. We’ve been through it and I have a sense of what you’ve been through. Thank you Ellen, for your kind words. We’ve been through it before but it’s always so difficult. Sorry to hear you’ve lost pets, too. Many over the years. Each time the loss is different but the pain is the same. So sorry for your loss. Your Little Girl sounded like a beautiful kitty, inside an out. We had to help one of our fur babies cross Rainbow Bridge earlier this year, after a sudden illness. It never gets easier 😪 Sending you hugs. Thanks RoseyToesMeows, for your kind words about our kitty. Sympathy and hugs also for the loss of you kitty this year. Indeed it is always so hard. I just read about this news, so sorry you had to say goodbye to your dear little Ultraviolet. Pipo sends many loud purrs and Dalton adds some soft aroos, too. It was so good that she knew love and the comforts of a good home instead of the harshness of the feral life. How pretty and sweet she was. We made you a memento picture, and sent it in a message to your FB profile…I do not know how to post it in the comments here…. I will post in next week in our regular Sunday Selfies post. Thank you for your kind words of sympathy and comfort, Meezer’s Mews and Terrieristical Woofs. Thank you for making the memorial picture of our kitty. Hugs. Thank you Meezer’s Mews & Terrioristical Woofs, for your kind words and purrs and aroos and for making the memorial picture. I’m sorry to read about Ultraviolet passing the rainbowbridge. She was loved and she takes this love and your family in her heart where ever she may go. Thank you for your kind and comforting words, Yvon. UV will also stay in our hearts forever. Thanks you for your kind sympathy, paws2smile. I’m so sorry to hear of the loss of your Storm, too. Hugs in return. Thank you for your kind message of sympathy angelwhisper2011. It really does help to know that other kitties and people understand how we feel, and we are so glad that we, and Ultraviolet, had the change to meet y’all. We miss her so much and try to treasure memories, and hope for a meeting one day at the Rainbow Bridge. Our deepest sympathies on the passing of Ultraviolet. Always so hard, but you can take comfort in the fact that she didn’t have to endure a long and difficult illness. Thank you for your kind words and sympathies, FACE Foundation. It is indeed better that she had a peaceful passing and lived so cheerfully while she was with us. What a fortunate cat to be able to spend her last year in such a loving home. And to be able to pass away so peacefully. You were meant to be with each other. 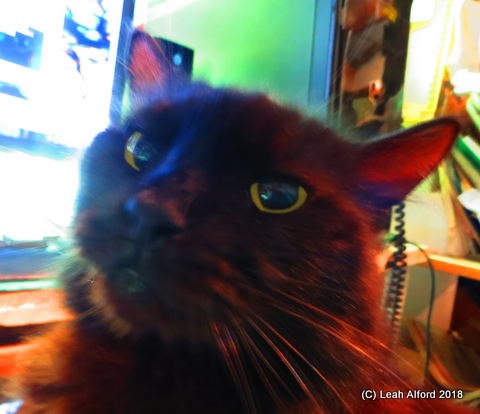 I was happy that my precious feral cat Pharoah passed away at home… he was only 13 but I knew he wouldn’t have a long life… although I believe he had a happy one. You gave Ultraviolet a great gift… just as she gave you the gift of her last year. Wonderful memories. Thank you RMW for your kind words and for telling me about your kitty Pharoah. I’m so sorry you lost him, too. I am glad we had the chance to be her people in her last year, and I’m trying to hang onto the memories. So sorry to hear about your loss of Ultraviolet. It sounds like she passed peacefully, always a blessing. Your pain is fresh to me as well, as we had to put to sleep on Friday, our own Squeaky. As a rescue, I’m not sure how old she was, but we’ve had her 17 years, so it was a good life we gave her from her beginnings in a feral colony. It is hard to say goodbye, even though we know that death is a part of life. May they both now rest in peace, pain-free. Thank you Eliza for your kind words and for telling me about your Squeaky. I am so sorry about your loss of her, too. So many of the kitties found living outside, strays and ferals, make such wonderful pets. Thank you, they add much to our lives. Oh, I am so very sorry. It doesn’t matter how long they have been with us it is never enough time! I love that you seem to be focusing on the time you did have and that you made here life lovely. Thank you terrepruit, for you kind words of sympathy and support. I’m trying to hang onto the good memories all I can but am still so stunned. Understood. So sorry. You know what they say, “they leave paw prints on our hearts”. Oh, no, Leah, I’m so sorry! A year with a kitty, no matter their age, is just not enough. But it’s so wonderful that you did take her off the streets and that she knew love and comfort for that time. It’s also sweet that she passed at home, in her sleep, with her loved ones nearby. Still so sad. I hope another kitty will come your way soon since a house doesn’t seem to be a home without a cat. Condolences. RIP, UV. Thank you Candace, for your kind words of sympathy and support. We’re still feeling so stunned. I hope for another kitty as the house does feel so empty, but we are so busy right now we might have to wait before we seek one. But it’s also true that cats seem to somehow find us, so it could happen sooner. I’m so very sorry for your loss. I lost my dear cat last summer, still miss him greatly. It does get easier in time, even if it’s never the same again. I’m glad your cat had a good life with so much love for her in the end ❤ Treasure the memories. With love, C.
Such sad news. Our little friends’ lives always seem too short. But I’m so glad you made Ultra-Violet’s last year such a happy and secure one. She obviously enjoyed it. Thank you toutparmoi, for your kind words of sympathy. I can only hope Ultraviolet knew how happy she made us. Thanks also for the encouraging wishes for the book. I’m getting closer but have a ways to go. I am so sorry. Luckily for her, she found a loving home for the last part of her life. I’m sure she felt loved. Thank you cat9984, for your kind sympathy. I hope she knows how happy she made us. So sorry, Leah and William! It’s always hurtful and bewildering when unexpected. Leah, you have immortalized Ultraviolet in your writings. Thanks Sondra, for your kind words. I’ll never forget her and I hope others will remember her too. I am sorry to hear about Ultraviolet. It was a shocking unexpected surprise. Words fail. Greg, thank you for being here and for your kind words. It’s very hard when it’s sudden but it’s a comfort that her leaving was peaceful. So very sorry, Leah!!! We lost our dog of 17 and 1/2 years and never got another dog. It is heartbreaking. But you gave her a wonderful last year of life and lots of love and take solace that you did such a wonderful thing!! Hope you can feel better physically as I know how that can make everything worse. The loss will take time. I send you hopes for your healing and good luck with your book!! Would that we could all go in our sleep instead of hooked up to machines in hospitals. Thank you stockdalewolfe, for your kind and soothing words, we appreciate it and I know Ultraviolet does too. I am so sorry about your dog, too. Thank you also for the well wishes and the encouragement about the book! It’s hard when loss is sudden but it is comforting that her leaving was peaceful. sorry for your loss. Precious Kitty. Thank you Sharony for your kind and soothing words, we appreciate it and I know Ultraviolet does too. So sorry, Leah. We’ve lost pets and know the pain. UV was a pretty cat. We have one left who is now 17, Chloe (also known as Chlo-cat, Fatso, Chubsie-Wubsie and Lumpy Plumpy). It’ll be tough when she goes. Look forward to your book. It’ll happen! (Mine seemed like it took forever.) Also, I always notice your “likes” on my posts and really appreciate them. Take care. So sorry for your loss of Little Girl, it is wonderful you were there for the snuggles before she went peacefully in her sleep. I am still coming to grips with losing Trinity and I know how hard it can be. I think it is wonderful you gave her a wonderful home and love and are willing to open your heart up again to another sometime. Best wishes for happy memories to flood your mind and for your book to go well- as I know how hard that can be too. The one thing I try to comfort myself with is that when they go suddenly like that, they didn’t undergo years of suffering – it just makes it harder for those of us left when it’s such a shock. Prayers for you. KiM, thank you for your kind and soothing words. I am so sorry for your loss of Trinity, too. It is very hard when it’s sudden but it’s true that long lingering illness can be difficult too. I’m trying to focus on sweet memories. Thanks also for good wishes about the book. Hugs. Hugs, Doug, thank you so much for your kind words of sympathy. We appreciate it. You are welcome. It was a sad day, the first of many. So sorry to read this sad and painful news about the passing of Ultraviolet. It is always so hard when you have to give up one of your furry friends. Please cherish all the warm and beautiful memories of Little Girl deep in your heart. Wishing you lots of strength and love. Thank you Herman, for your words of sympathy and comfort. I am indeed trying to keep Ultraviolet, Little Girl, close with the sweet memories. I am so sorry. They only have little lives, but you gave her the best love and time with you. Thank you Nia, for your kind and comforting words. I remember your Princess, Surya, I am so sad and sorry you lost her too. Thank you for thinking of me, much love, Leah. It is hard when our companions leave us, especially when they are young. I am saddened to learn dear little Ultraviolet passed away, Catwoods. She was a very beautiful kitty. Your sweet Ultraviolet will get flowers here in her memory. Thank you so much Lavinia, for your soothing thoughts and for saying that Ultraviolet was beautiful. And for the flowers, that is so kind of you! We appreciate that so much and I’m sure Ultraviolet does too. Thank you elizabetcetera for you kind sympathy and words and for caring about our Ultraviolet kitty. I’m glad you think she was beautiful. Hugs for you also. Thank you CatLadyintheCanyon, for you kindness and sympathy and for telling me about your kitties. I am so sorry you lost Topper and Bella and that they were also in the middle years like Ultraviolet was. It’s been hard because it was so sudden but I am trying to hang onto the sweet memories and the sense of her lingering presence. They are like family. Ultraviolet was very lucky to have been with you for the time that she spent with you. Thank you so much Tom, for your kind and soothing words. Animal friends are indeed family, I agree. It is heartbreaking when a lovable member of our family suddenly dies.so sorry for your loss. Margo, thank you so much for your kind sympathy. The suddenness has indeed made it very difficult. Such sad news! I love the older cats too. You did good. Thank you Mollie, for your kind and soothing thoughts. I had hoped for more time but am hanging onto memories. Words don’t describe how sad this news makes me. I thought you and Ultraviolet would be besties for years to come. But as you said, you were able to make her last year probably her best year and she surely loved you for that. Thank you, catsworking, for your kind thoughts. I too thought we would have more years with Ultraviolet. I am happy, as you say, that she was with us rather than out on the streets, when she left. I’m so sorry. What a shock when they leave like that. You didn’t have to watch her suffer with any condition, at least your most recent memories are of her being her sweet self. I thought I’d missed something. Good luck with your book. Thank you Bernadette, for your kind thoughts. The suddenness did make it very hard as I was hoping for more years with her. But it is a comfort that her leaving was peaceful, and I am trying to hang onto sweet memories. And I so appreciate your good wishes about the book! Oh, Leah, I am so very sorry about UV. When your post popped up in my email I audibly gasped. It’s so hard to believe. I know how much you and your husband loved UV, and I know she loved you back. She was lucky to have you two take her into your lives. Cats are the most miraculous creatures—loving, caring, affectionate—and we want them to be with us always. Whatever it was that whisked her little spirit away so suddenly—well, I suppose you can be glad she didn’t suffer (we’ve had cats who have and it was gut-wrenching). Now UV is in the spirit world, but her love for you and your husband lives on forever. No need to worry about keeping up with the blogosphere—it’s always here, always waiting. I hope you can use UV’s editorial guidance to finish your book. I for one, cannot wait to read it! And what a way to honor UV. Dear Leah, I’m keeping you and yours in my thoughts and prayers tonight. Thank you so much for your kind and soothing words, Deb. This was really hard because it was so sudden, but I am glad that UV was with us and not living outside, and that her leaving was peaceful, as you say. Thanks also, for your very welcome expressions of support for my book! It really helps as I’m a bit discouraged, thinking I don’t have enough energy to go around. But I will keep at it! Oh this breaks my heart too! Shedding tears for your loss, but I’m thankful this beautiful girl enjoyed her final days in such a loving home with you and that she slipped away peacefully and without pain. Thank you Susanne, for your kind sympathy. I too am grateful that she was living with us rather than on the streets and that she left us peacefully. I am so sorry! I know you hadn’t had her long. But I am so glad for her that she found you for this last part of her life, and was able to spend it surrounded by comfort and kindness. Thank you TextileRanger, for your soothing words and kind thoughts. I too am glad she was with us rather than living outside. Thank you Lauren, for your kindness and for telling me about your kitties. I’m so sorry you lost Coolidge. In the past, we managed a diabetic cat for two and a half years who also lived to age 17. It’s good that Effie was able to help right away! And more recently, Paladin. This is an especially busy time for us so I’m not sure how soon we may get another cat. That is what I would like to do but I think my husband needs some time. But I do believe you are right, getting another cat is a huge step towards healing. Thank you, Leah. I always say I didn’t rescue Effie–she rescued me. Now I think of Paladin not as a rescue cat, but as a family enlarger! So very sorry to hear this, I had become fond of Ultraviolet, too, through your posts, and had hoped, like you, that she’d be around for a long time. So glad she got to spend the end of her life in such a loving home, and that she got to slip away peacefully, rather than suffering a long debilitating and painful illness. I’ll be thinking of you. Thank you Cate, we appreciate your kind words and sympathy. And it makes me smile to think you were fond of Ultraviolet too! I too am grateful her leaving was peaceful. That is so sad. I’m so sorry to hear of the sudden and unexpected loss. It’s so hard to lose our lovely kitties, but you gave her a good home and a good life for a year. We do all we can for our kitties, but sometimes their prior lives have been so difficult, that they succumb too easily to sudden episodes. She celebrated the new life you gave her with love and purrs, and the love and attention you gave her in return is with her for eternity. Thank you for your kind words and sympathy, Timothy. She made us so happy with those purrs. Oh I am so sorry about your loss. I had an elderly cat that passed like that, quietly in his sleep. There are definitely worse ways to go than quietly in your sleep in a home where you are loved. Thank you tumbleweedstumbling, for your kind words. We are indeed glad she was with us instead of living outside.